2 - Two Spots on Oman Sail’s Extreme Sport Racing Yacht on 22nd to 24th February 2011. Two guests for one complimentary night in an Executive Suite inclusive of breakfast. and two guests for complimentary dinner inclusive of a bottle of house wine at Marjan. More prizes are coming in all the time, and if you would like to purchase a raffle ticket but can't attend this evening - please get in touch with Pete Rigby on 9921 1203. There is also a home game this Friday. 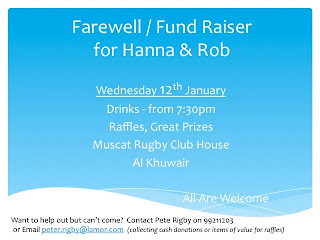 The local Muscat boys are playing against the Al Ain "Fijians" on Friday at 3pm.... your support is as always very welcome.